What's playing at the Chinese, anyway? Sid Grauman must not have had too high a regard for marquees. Once he moved his operations to the Los Angeles area in 1917, his marquees - the signs telling people what film was playing at a theater - were all rather small. 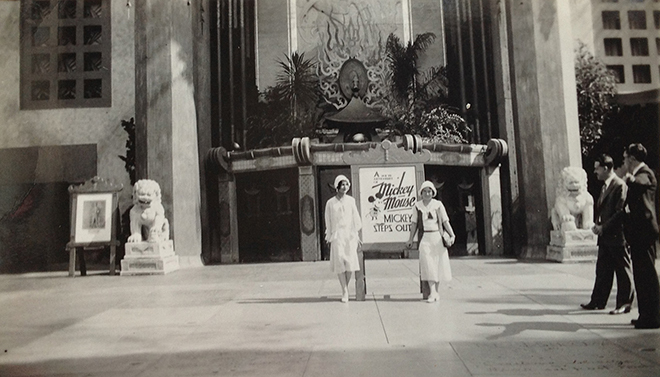 When you take a look at the original sign installations at the Million Dollar (Grauman's Theatre is what it was called when it opened in 1918), the Rialto (1919), or even the Metropolitan (1923), one cannot help but notice the restrained design of the signs advertising what was currently playing. Partly this had to do with the aesthetics of commercial design in the late teens and early 20s in California, and partly the notion, common among theatre operators at the time, that the public rarely cared what was playing; they came week after week, and this is what mattered. Grauman's Theatre, Downtown Los Angeles. 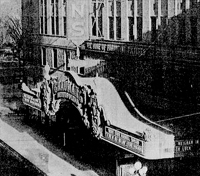 Entrance, just prior to it opening on February 1,1918. This marquee did not extend out to the curb; it was flush with the building's facade. Grauman's Rialto Theatre, Downtown Los Angeles. Exterior, September(? ), 1923. This theatre had been built by another party. During Grauman's tenure, little had changed on the exterior - except adding "Grauman" to the top of the rooftop trestle sign. Grauman's Metropolitan Theatre, Downtown Los Angeles. Exterior, Circa1923. 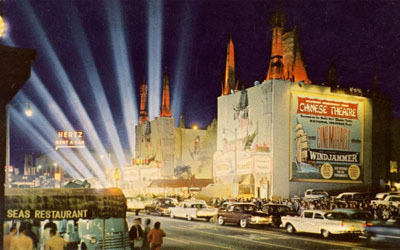 Although the Metropolitan had a large marquee, this shows that much of the space went to the display of the Grauman name. But then again, there was that famous Grauman name. Usually, the Grauman name got top billing over everyone. 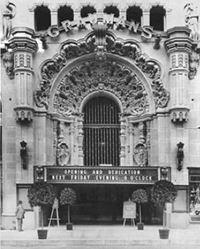 These were GRAUMAN theatres, and this idea carried over to his Egyptian Theatre in Hollywood, opened in 1922. 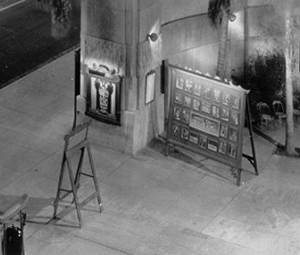 At the Egyptian, Grauman had two conflicting desires: his traditional display of the Grauman name, and the impulse to steep his customers in an atmosphere so exotic, so unusual, that unorthodox design solutions became the norm. 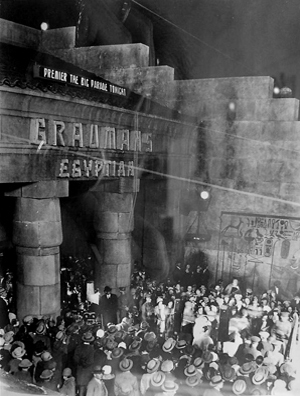 This shot of the Egyptian entrance portico, taken during the premiere of The Big Parade in 1925, shows that, while the Grauman name receives the largest size, the name of the film playing is relegated to a smallish back-lit box attached to the roof, almost as an afterthought. Later owners and operators of the Egyptian Theatre have erected a number of solutions to this "What's Playing?" problem. Grauman's Egyptian Theatre, Hollywood, California. Entrance, November 2, 1925. 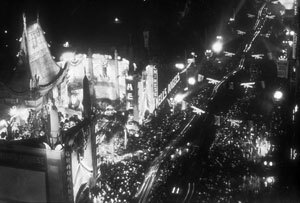 This photo, taken the opening night of The Big Parade, shows how at the entrance, well back from Hollywood Boulevard, the Grauman name was most prominent. What is important to remember in this survey of marquees at the Chinese, is just how much of an afterthought they were. 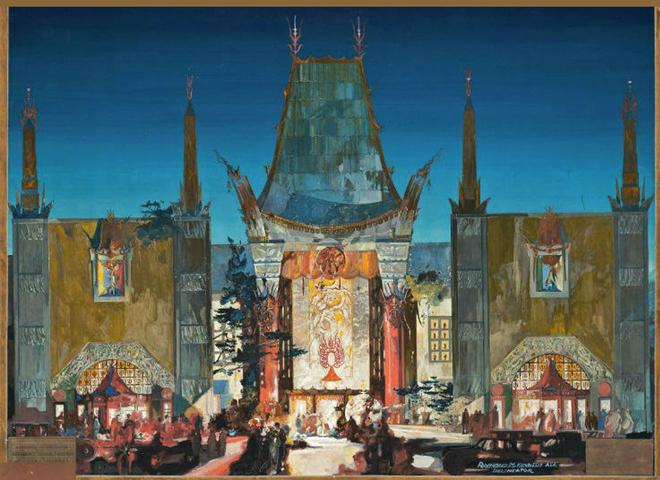 As the lead architect of the Chinese, Raymond M. Kennedy's presentation painting of the facade shows the building unmarred by signage of any kind. The commitment to the notion of transporting the patron to the house of Grauman is total. 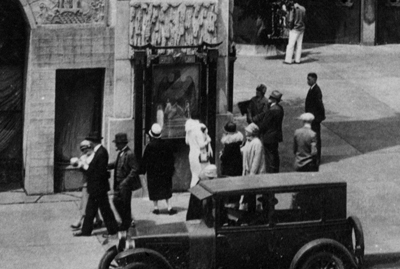 Also worth bearing in mind is that when the Chinese opened in 1927, Grauman's policy was to show well-known pictures, accompanied by his lavish prologues, on a twice-daily, reserved-seat basis, therefore expecting customers to be fully aware of what film they were coming to see, thus reducing the need for signage. Grauman's Chinese Theatre, Hollywood, California. Presentation painting by Raymond M. Kennedy, Undated, probably late 1925. Tempra on cardboard. 33 inches wide x 23.5 inches high. Indeed, during the very earliest period under Sid Grauman's sole directorship, this idea was changed very little. 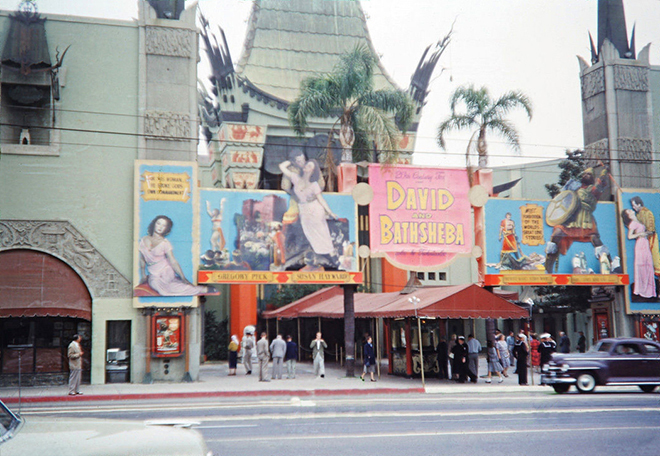 The two "blade" signs, carrying the name of the the theatre and its proprietor, were there from the beginning, while as this photo of the premiere of The Gaucho shows, the star of a particular film could have their name displayed on a banner hung out front, which was a common practice in Hollywood during this period. Grauman's Chinese Theatre, Hollywood, California. Exterior, Friday, November 4, 1929. The Gaucho premiere. This photo shows the original stenciled fabric canopy extending out to the curb on a rainy evening. One could set it up, or take it down as one wished. Since the earliest days of the cinema, posters were the dominant method of enticing passersby into a theatre. 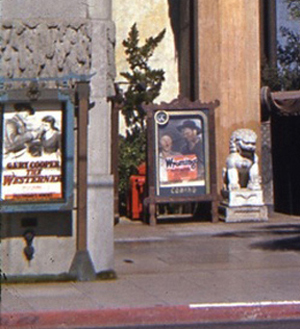 To compliment Grauman's decorative scheme, the poster cases at the Chinese were very exotic creations. Two metal uprights rose from aged brass bases, spanned at the top with a horizontal holder resembling those used for a Chinese sedan chair. The poster case itself was suspended from this holder, and was bound at the corners with heavy brass fasteners. The case may have swung free. It was topped with an elaborate star. The posters usually were elaborate hand-made signs, created by on-staff sign-makers in the basement. LEFT: Grauman's Chinese Theatre, Hollywood, California. 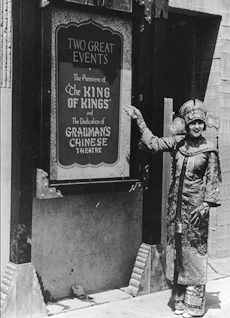 Exterior showing poster case facing south on the east side of the forecourt opening, taken just before the Wednesday, May 18, 1927 premiere of King of Kings. RIGHT: Grauman's Chinese Theatre, Hollywood, California. Exterior showing poster case facing south on the west side of the forecourt opening, during the engagement, from Wednesday, May 18, 1927, of King of Kings. 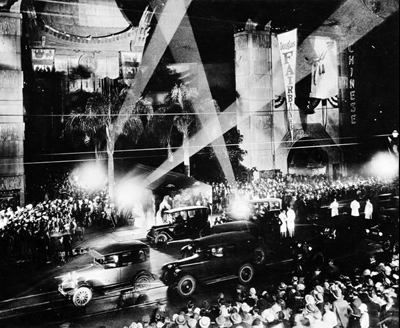 The first departure from Sid Grauman's original concepts came during the run of The Hollywood Revue of 1929, which opened in June of 1929, after Grauman had sold his interest in the theatre to Fox West Coast Theatres. 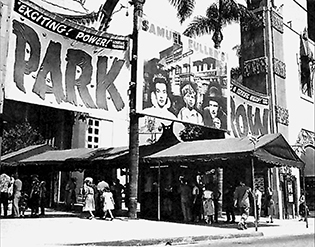 Howard Strickling, publicity head at M-G-M, was determined to make Hollywood Revue a standout attraction, and so, an enormous electric sign advertising the show was attached to the east wall of the building, where everyone driving west on Hollywood Boulevard couldn't fail to see it. Grauman's Chinese Theatre, Hollywood, California. Exterior, Thursday, June 20, 1929. 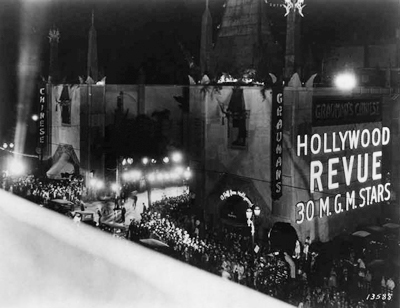 The Hollywood Revue of 1929 premiere. 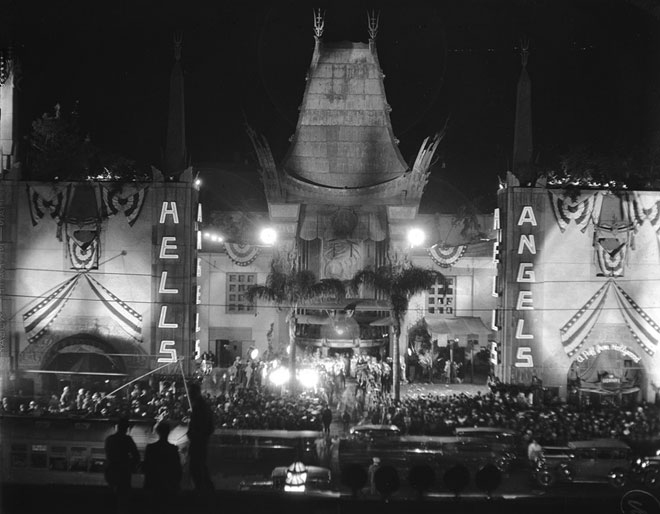 The next step in this publicity war was taken in 1930 with the premiere of Hell's Angels, which took the specially-constructed electric sign idea and ran with it. Grauman's Chinese Theatre, Hollywood, California. Exterior,Tuesday, May 27, 1930. Hell's Angels premiere. Howard Hughes was looking to make a huge hit out of Hell's Angels, and so nothing modest or coy would do. The neon letters were not permanently attached to the building, but rather hung down from the top, like a necklace. 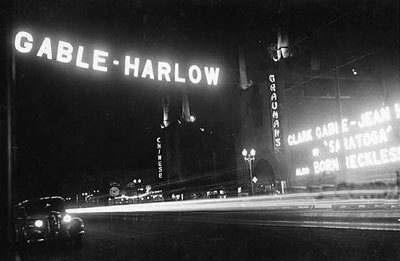 In addition, Hell's Angels was spelled out in even larger neon channel letters hung up on a large readerboard framework to the east of the theatre. Notice the lack of a mention for the Sid Grauman Prologue accompanying the film. Grauman's Chinese Theatre, Hollywood, California. Exterior, Tuesday, May 27, 1930. Hell's Angels premiere. 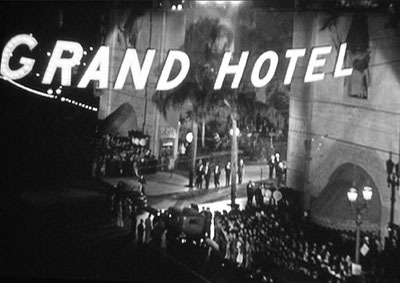 By the April 1932 premiere of Grand Hotel, this sign with interchangeable letters had been strung across Hollywood Boulevard from the eastern corner of the Chinese over to the top of the three story building across the street. This amazing sign was changed with the change of bill at the Chinese up until 1940 or so. Grauman's Chinese Theatre, Hollywood, California. Exterior, Friday, April 29, 1932. Grand Hotel premiere. Grauman's Chinese Theatre, Hollywood, California. Exterior, during the engagement, from Thursday, June 11, 1931, of Trader Horn. Grauman's Chinese Theatre, Hollywood, California. Exterior, Friday, February 2, 1934. The photo was issued for some reason for a Paramount picture called Search for Beauty. The Chinese does not appear in the film. Grauman's Chinese Theatre, Hollywood, California. Exterior, showing poster cases during the engagement, from Tuesday, October 8, 1940, of The Westerner. Grauman's Chinese Theatre, Hollywood, California. Exterior, during the engagement, from Friday, November 15, 1934, of The White Parade. During this early period, the Chinese forecourt was littered with signs and easels of all sorts. 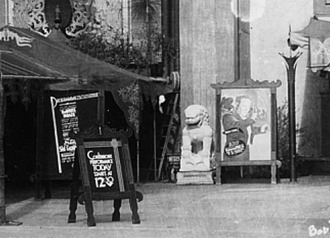 Since the forecourt was not filled to the brim with footprints yet, it was possible for the theatre's staff to set these up every day to entice customers in. In the photo above and to the left, we have a rare glimpse of the poster case hung on the forecourt opening wall, which was of a different design than what was there later. These cases were swapped out for another design in 1945. The large display easel in the picture is especially impressive, and contains portraits of all the performers in the current attraction, and has a picture-frame light over it to illuminate them at night. This easel was around 9 feet tall and 14 feet wide! The photo to the left is part of the earliest Kodachrome color photo we have of the Chinese, taken in the fall of 1940. Not only does this show the original raw concrete of the street facade, but also the coloring of the forecourt interior walls, which was sort of a mottled yellowish/orange, while the lower part of the main pagoda pillars has been repainted while the original coral coloring is seen further up. We believe that the poster cases out front had been repainted since the opening of the theatre 13 years before, but the easel poster case color is probably original. The readerboard to the east of the theatre was essentially a series of telephone poles, with adjustable wooden horizontals, to which the letters were attached to. This photo from the premiere of Strange Interlude shows the line "Sid Grauman Prologue" in lightbulb-filled channel letters, about five feet tall, with Strange Interlude spelled out in oversized letters, perhaps seven or eight feet tall. 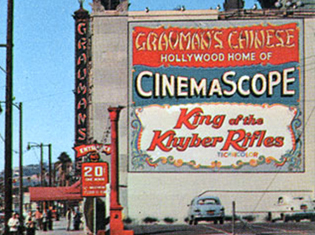 During this time of the last stages of the Grauman Prologue policy, the films playing frequently had custom-made channel letters made for this readerboard. Grauman's Chinese Theatre, Hollywood, California. Exterior, Friday, July 15, 1932. Strange Interlude premiere. It is not possible to determine the time this photo was taken - probably late afternoon - but this crowd formed early for an 8:30 PM premiere. After late 1934, the Grauman prologues were dropped, and films were played (sometimes with a second feature) with shorts and newsreels four or five times a day, usually for one or possibly two weeks. And so, a more regularized approach to the readerboard was developed in favor of the five-foot letters, as shown in this photo, taken during the one-week run of Saratoga and Born Reckless in 1937. It is hard to imagine the work that went into changing these large electric letters around every week, but they did it. The sign over the street very often contained the last names of the two headliners of the "A" picture, or the full name of the one headliner, or sometimes only the name of the "A" picture. Grauman's Chinese Theatre, Hollywood, California. Exterior, during the engagement, from Wednesday, July 21, 1937, of Saratoga and Born Reckless. The last photograph we have of eastside readerboard dates from August, 1948. Certainly by 1950, it had been dismantled, leaving no signage available for the films aside from the poster cases, which did grow larger for some films during this period. The first picture to slather the front of the theatre with specially-made signs advertising the movie was for Cyrano de Bergerac, which played in July, 1951. Before long, producers tried several diferent approaches to this idea. Grauman's Chinese Theatre, Hollywood, California. Exterior, taken during the engagement, from Friday, July 27, 1951, of Cyrano de Bergerac. Grauman's Chinese Theatre, Hollywood, California. Exterior, during the engagement, from Thursday, August 30, 1951, of David and Bathsheba. Grauman's Chinese Theatre, Hollywood, California. Exterior during the engagement, from Wednesday, December 5, 1951, of Fixed Bayonets! Grauman's Chinese Theatre, Hollywood, California. Exterior during the engagement, from Monday, September 1, 1952, of Park Row. Television was with us, and producers and studios were moving toward the "event" picture. The runs were getting longer. 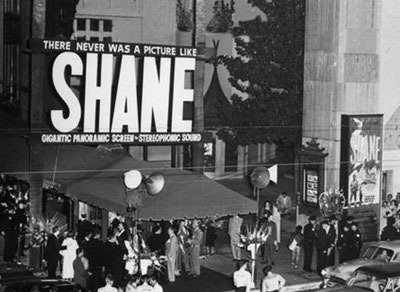 When Shane was premiered at the Chinese in 1953, the fabric banner had been replaced by an especially constructed channel letter sign. This sign lasted for the film's entire eight week run, then was hung outside the Fox Beverly during the film's moveover run there. Grauman's Chinese Theatre, Hollywood, California. Exterior, Thursday, June 6, 1953. Shane premiere. Grauman's Chinese Theatre, Hollywood, California. Exterior during the engagement, from Friday, July 31, 1953, of Gentlemen Prefer Blondes, showing built-out poster case with 18 foot tall Marilyn Monroe (Jane Russell was on the other side). Grauman's Chinese Theatre, Hollywood, California. 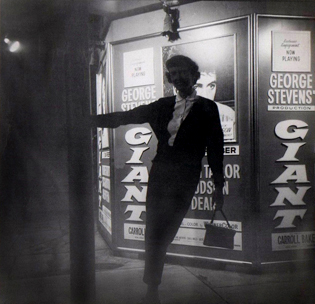 Exterior, during the engagement, from Wednesday, October 17, 1956, of Giant, showing a tourist posing before displays for the film wrapped around the original box-office. As the "event" movie appeared, larger displays were required to match the scale of the films themselves. At the Chinese, film distributors were constantly thinking up new ways to dress up the forecourt and encourage visitors to come in and see the picture. 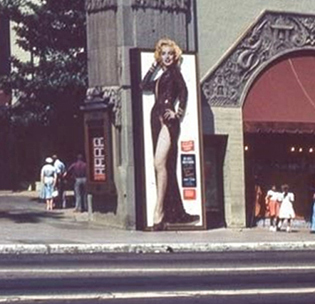 The very large poster boxes which were installed around the street front poster cases for Shane, were appropriated for Gentlemen Prefer Blondes, and covered with 18 foot tall figures of Marilyn Monroe and Jane Russell. Then too, the old box-office was very occasionally wrapped in hand-made displays for the latest super colossal production, such as Giant. With the introduction of CinemaScope, Fox executives sought to promote it and their first production in the process to really wow Hollywood and the rest of the nation. What they came up with was a large trestle sign spanning the forecourt opening. 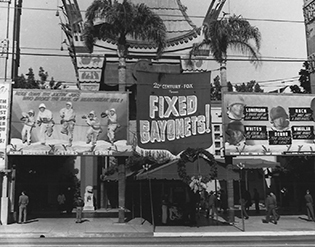 This huge sign is shown here being installed on September 21- 23, 1953, by the Luminart Neon Company of Long Beach. Grauman's Chinese Theatre, Hollywood, California. Exterior, Wednesday, September 23, 1953. Installation of CinemaScope Sign. Grauman's Chinese Theatre, Hollywood, California. Exterior, Thursday, September 24, 1953. The Robe premiere. The Robe played the Chinese for 11 weeks. After that, Fox fed to the Chinese all of the films they had in the CinemaScope pipeline. The names of the films were spelled out in interchangeable neon letters, backed with white wood or metal. The neon color of the interchangeable letters would change also. Sometimes yellow, sometimes purple as seen in this shot from the late 1954 engagement of There's No Business Like Show Business. Grauman's Chinese Theatre, Hollywood, California. 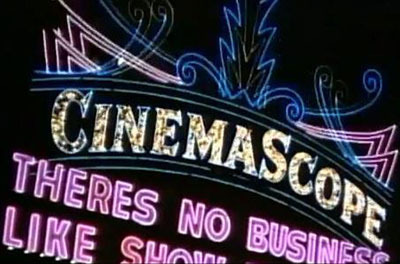 Exterior, during theengagement, from Friday, December 24, 1954, of There's No Business Like Show Business, frame grab from a YouTube video "Hollywood Neon Theatres Clubs and Restaurants at Night 1950s" by soapbxprod. Grauman's Chinese Theatre, Hollywood, California. Exterior during the engagement, from Friday, February 5, 1954, of King of the Khyber Rifles. Grauman's Chinese Theatre, Hollywood, California. Exterior during the engagement, from Wednesday, May 4, 1955, of Daddy Long Legs, with upcoming attraction The Seven Year Itch displayed. 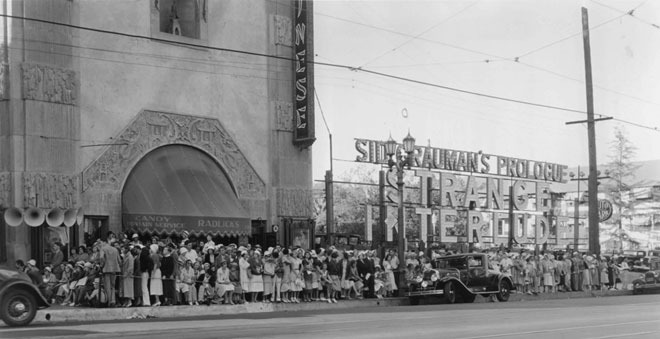 The eastern sidewall of the theatre — unused since the Hollywood Revue days and visible for a considerable distance down Hollywood Boulevard, was expropriated to announce to one and all that Grauman's Chinese was the "Hollywood Home of CinemaScope." An elaborate frame and huge CinemaScope letters dominated, with each attraction painted in underneath. Once the CinemaScope brand became less important, the frame began to change over the years, but the basic idea was still the same: a crew would get up on their scaffoldings and hand-paint a new sign for each attraction. 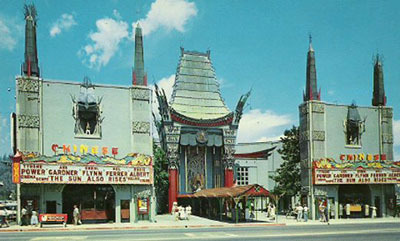 This was kept up until the erection of the Mann Chinese Theatre Twin in 1979. Grauman's Chinese Theatre, Hollywood, California. Exterior during the engagement, from Friday, June 14, 1957, of Island in the Sun. Sign painters (on admittedly flimsy supports) painting in sign for the next attration, An Affair to Remember. 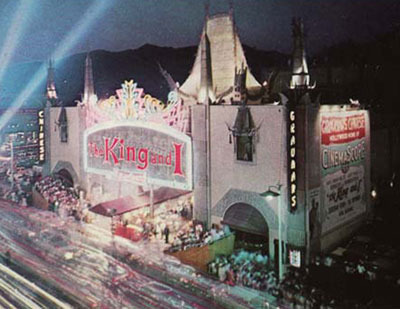 By early 1956, the "CinemaScope" letters came down from the trestle sign and an elaborate neon border went around the area, leaving the entire frame available for a film's title display, as seen in this photo from the 1956 premiere of The King and I.
Grauman's Chinese Theatre, Hollywood, California. Exterior, Thursday, June 28, 1956. The King and I premiere. 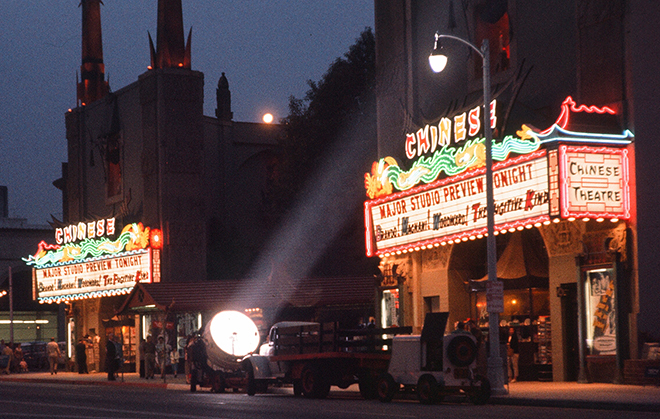 The CinemaScope advantage began to wear off on the public, while 20th Century-Fox's lock on the Chinese Theatre was beginning to slide as well. The CinemaScope trestle sign is shown being dismantled in this rare snapshot taken on August 22, 1957. Sometime in the middle of the engagement of An Affair to Remember, the next step in the marquee evolution was in place: the "dragon" marquees. Grauman's Chinese Theatre, Hollywood, California. 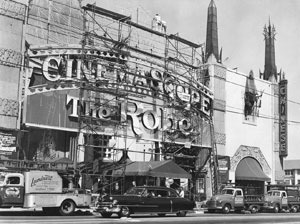 Removal of the CinemaScope sign, Thursday, August 22, 1957. More changes were forthcoming, however. Fox West Coast Theatres, which had been operating the Chinese since 1929, was forced to become its own stand-alone company, separate from the 20th Century-Fox studio. Their president began developing a new wide-screen process they believed would top CinemaScope. 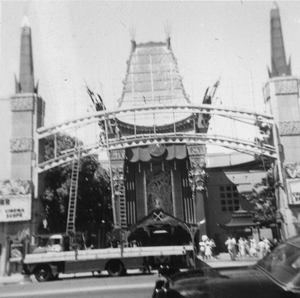 Windjammer opened at the Chinese with the new twin neon dragon marquees on April 8, 1958. Grauman's Chinese Theatre, Hollywood, California. Exterior, Tuesday, April 8, 1958. Windjammer premiere. These amazing marquees were actually installed a few months ahead of the Windjammer premiere. 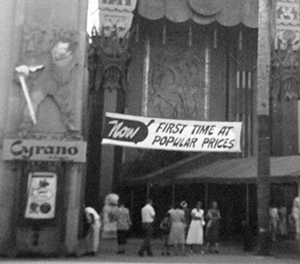 They were installed in time for the engagement of The Sun Also Rises in August of 1957, as a part of a general 50s spruce-up of the theatre, which included removal of the "blade" signs, new poster cases, and replacing the fabric canopy running out to the street with a metal one. Initially, The "CHINESE" letters were freestanding, supported on 2-inch square metal pipe. Grauman's Chinese Theatre, Hollywood, California. Exterior during the engagement, from Wednesday, August 28, 1957, of The Sun Also Rises. It might have been originally designed to work in this fashion, but by the premiere of Windjammer in April of 1958, large backboards had been installed, allowing the "CHINESE" to stand out better. These incredible neon signs were hung on the façade of the two souvenir shops, both east and west. The readerboards were tilted down toward the street slightly, as well as toward the middle of the theatre, so they canted out from the building as they got toward the outside edge. The tracks on the readerboards were spaced to fit the beveled plastic marquee letters, which had come into use by the mid-50s, as may be seen in The Sun Also Rises picture above. But sometimes a studio would pay to have a sign company make and install what were called "marquee stencils"; specially constructed signs, based on the lettering of the film's ad campaign, as may be seen in this photo from the engagement of The Blue Angel remake. The black letters were cut out of heavy-guage cardboard, then stapled to thin wooden runners, spaced to attach to the rails in the readerboard. The blue center in the "Blue Angel" letters would have been a blue plastic material, which would allow light to shine through. Grauman's Chinese Theatre, Hollywood, California. Exterior during theengagement, from Friday, August 28, 1959, of The Blue Angel. The dragon marquees at night were very impressive, but fewer pictures of the display at night were taken during the sign's early tenure. This photograph of the west dragon, taken for the catalog cover for the first FILMEX, held in November of 1971, shows it best. The whole thing was animated of course. The pink and blue woven pattern above and below the readerboard flash alternately very quickly, while the dragon itself was divided into 9 sections, turning on in quick succession from the tail to the head, then, the white outlining "CHINESE" would come on, then, the colored insides of the "CHINESE" letters would flash on and off twice, then the letters and the dragon would go dark, leaving only the flashing eyes of the dragon. There would be a pause, then the whole thing would start over. Grauman's Chinese Theatre, Hollywood, California. West Marquee, Circa 1971. If that weren't enough, the west marquee went though this routine approximately three times faster than the eastern one did, so they were never in synch. It was a lucky nighttime photographer who could take a picture with both dragons fully lit. Grauman's Chinese Theatre, Hollywood, California. Exterior during the engagement, from May 6, 1960, of The Fugitive Kind. 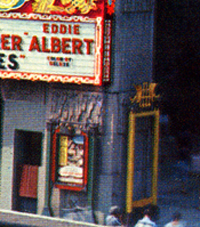 Later producers became fond of what became known as "reverse marquees" which was where the entire readerboard was covered in the heavy-guage cardboard, and the film's logo would be cut out and filled with colored plastic, as may be seen in this photo from the engagement of Enter the Dragon, which was aided by the tireless Warner Bros. PR departments' use of additional banners and a foam sculpture dragon over the canopy. Mann's Chinese Theatre, Hollywood, California. Exterior, during the engagement, from Friday, August 24, 1973, of Enter the Dragon. Mann's Chinese Theatre, Hollywood, California. East Marquee, circa June, 1974. Reconstruction. Grauman's Chinese Theatre, Hollywood, California. West forecourt poster cases, during the engagement,from Wednesday, August 28, 1957, of The Sun Also Rises. Photo courtesy Cazar Del Valle of theatretalks.com. Grauman's Chinese Theatre, Hollywood, California. 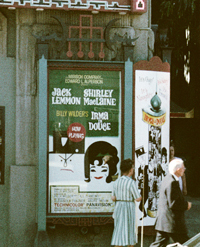 West forecourt poster case, during the engagement, from Wednesday, July 3, 1963, of Irma La Douce. TCL Chinese Theatre , Hollywood, California. 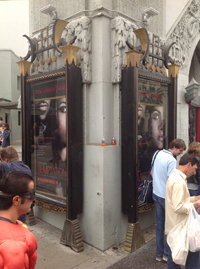 East forecourt poster cases, during the engagment, from Friday, March 29, 2013, of Tyler Perry's Temptation. In 1957, as part of the Windjammer remodel, the original poster cases underwent an expansion. As the photo above left shows, the metal uprights were replaced with longer lengths of metal, some of the original hardware was retained, and new crown tops and bottom fretworks installed. These very large cases held elaborate custom-made 4 x 8 foot posters from this time up into 1973 or so. After that, the displays were mostly mounted printed posters and stills. While these cases may be opened, most of the time the posters are slid in through a door on the side. These cases have been painted a few different colors over the years, while the case on the very westernmost side of the theatre disappeared in April of 1992. The current black and gold paint job was executed by Amy Higgins for the 2001 remodel. It has been rumored that the cases will be outfitted with LED displays in the near future. 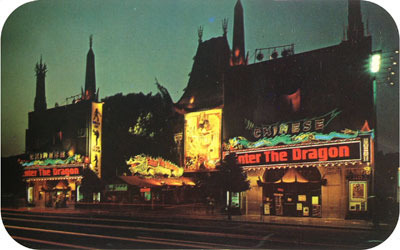 The dragon marquee configuration lasted 44 years, from 1957 until 2001. It is seen below on its last night of operation in 2001. The Chinese take-out "Mann's" signs were added in April, 1976. 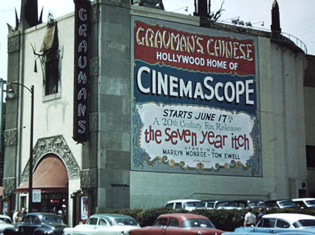 These signs offended many, as Mann Theatres officially consecrated the theatre as "Mann's Chinese" since the "Grauman" name had been missing from the building since 1957, and, once they took over operations in 1973, they referred to it as the "Mann Chinese." More about these marquees later. Mann's Chinese Theatre, Hollywood, California. East Marquee, Circa 2001. Photo by Larry Lytle. Courtesy of MONA. 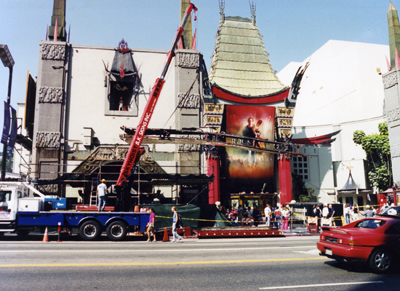 In 2001, a remodeling of the theatre was undertaken by its operators, Cinemerica, owners of the Mann Theatres chain, to which the Chinese Theatre still belonged. 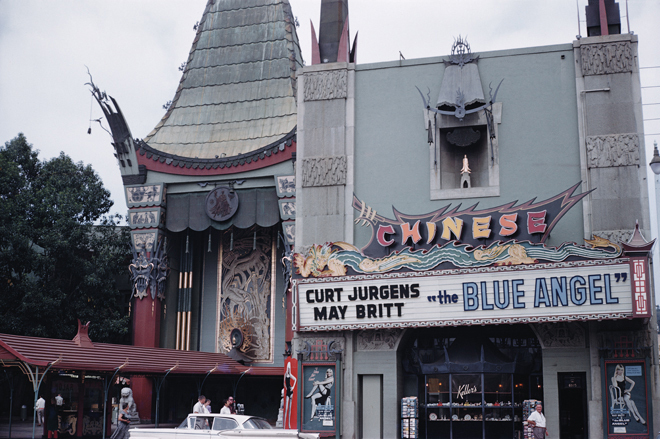 The design concept was to try to return the Chinese to a semblance of how it appeared originally, and so accordingly, the 1957 dragon marquees were removed, as was the "grind" box-office and metal canopy. New lighting was installed around the forecourt, and flat back-lit boxes replaced the marquees. 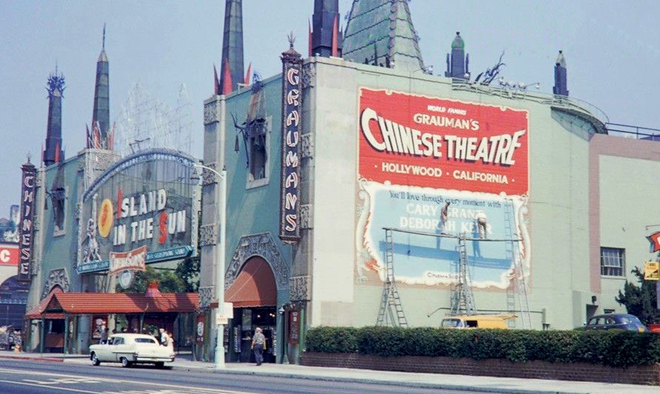 A most welcome detail was the replacement of the "blade" signs bearing the Grauman name, allowing moviegoers to rightfully call the theatre "Grauman's Chinese" again. Grauman's Chinese Theatre, Hollywood, California. West souvenir shop facade, Circa 2001. Photo by Amy Higgins, www.amyhiggins.com. These "Now Showing" boxes are filled with specially generated graphics, printed out on heavy translucent plastic. Here they are seen during the 2012 TCM Festival. Grauman's Chinese Theatre, Hollywood, California. Exterior during the 2012 TCM Classic Film Festival, Sunday, April 15, 2012. Still, on occasion, producers will decide that the two "Now Playing" light boards are not enough, and will hang up additional signage. Sometimes, a banner might be suspended at the entrance to the forecourt, as shown in this shot of Batman Begins, while at other times, a banner will cover the central pagoda (a practice begun with Enter the Dragon in 1973). Grauman's Chinese Theatre, Hollywood, California. 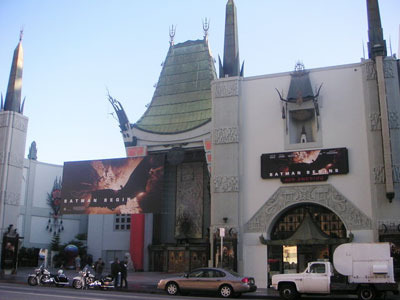 Exterior during the engagement, from Wednesday, June 15, 2005, of Batman Begins. Photo by KenRoe via Cinema Treasures. TCL Chinese Theatre IMAX®, Hollywood, California. Exterior during the engagement, from Friday, May 16, 2014, of Godzilla. 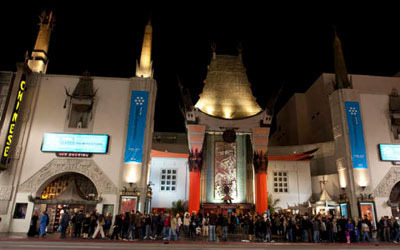 Since the Chinese Theatre has become named after the Chinese electronics company TCL, it seemed as though it would be natural that they would design and install snazzy LED display boards for the theatre, since the Pantages and the El Capitan had them for many months before the TCL sponsorship began in January, 2013. 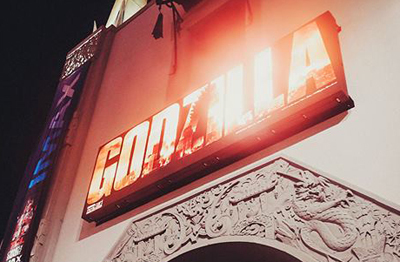 8mm pixel pitch LED boards made by TCL were installed just in time for the opening of Godzilla in May, 2014. They're bright! 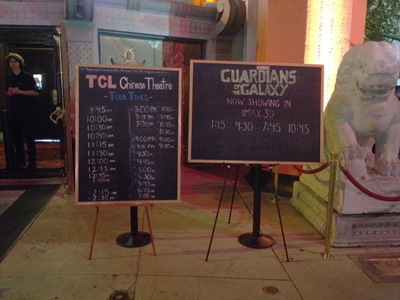 Not to be outdone by any of the forecourt standees of the past, the TCL Chinese Theatre informs tourists of the TCL Chinese Theatre Tours and showtimes for the film on these interesting chalkboards. TCL Chinese Theatre IMAX®, Hollywood, California. Forecourt, Friday, August 15, 2014, during the engagement of Guardians of the Galaxy. What happened to the Chinese dragon marquees? A good question has been: What happened to the dragon marquees when they were removed in late 2001? 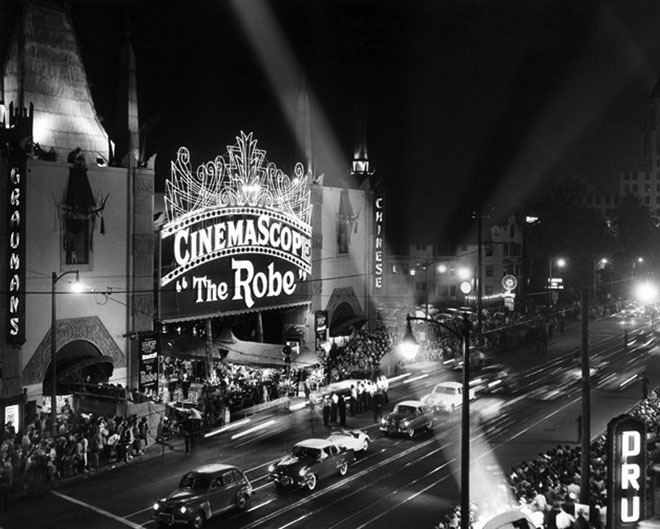 Robert Nudelman, President of Hollywood Heritage, had engineered a deal with Cinemerica, parent owners of Mann Theatres, to have the marquees donated to the Hollywood Heritage museum. 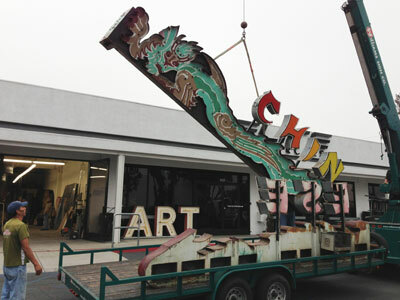 Nudelman suggested that the Los Angles-based Museum of Neon Art (MONA), headed by Kim Koga, take one of them. When the fateful day came for their removal by B.K. Signs, Nudelman, Koga and company were there at the Chinese, waiting with trailers to take them away, when some unnamed flak claimed them for Paramount PIctures (co-owners of Cinemerica), and they were hauled off to the Paramount lot, where they were rumored to be parked under tarps near the water tank / parking lot. This was, naturally, a considerable disappointment to both Hollywood Heritage and MONA. Undaunted, Robert Nudelman just happened to be on the Paramount lot in late December, 2007, when he saw some workmen moving the signs. He quickly asked them what was happening, and the men told him that they had received orders to junk them. Nudelman begged them to stop. No one knows how, but he got permission to take the signs. But given the fact that this was happening late on a Sunday afternoon, who could help move them? Nudelman called MONA's Kim Koga, who organized their removal from Paramount to a storage area MONA kept on Olympic. Grauman's Chinese Theatre, Hollywood, California. 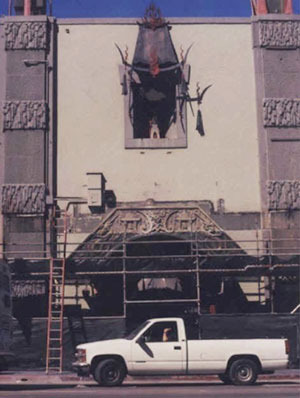 Removal of the west marqueee framing in September, 2001. Photo courtesy of MONA. Since it was Hollywood Heritage's Nudelman who had the good fortune to fast-talk Paramount managers into releasing the marquees, and MONA, who arranged for their dramatic removal and storage, both institutions decided that they would stick with their original plans and split the pair. MONA took the east one, while Hollywood Heritage took the western one. Alas, Robert Nudelman died in 2008. In 2010, MONA moved them from their storage on Olympic, to a new storage space in Glendale. Then, they were moved again in 2011 from Glendale to a space in Montclare, and in 2013, they have been moved again for repair work. 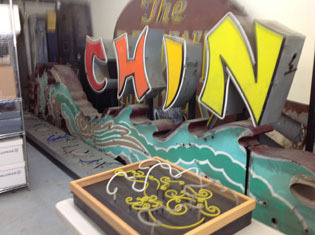 While Nudelman attempted to salvage every scrap of the marquees, including the large backboards, only the dragons and their "Chinese" letters have survived. The east dragon in storage at MONA on Thursday, May 2, 2013. 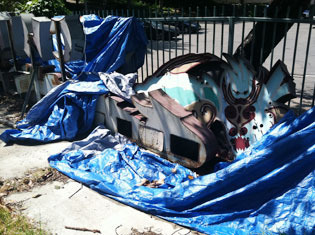 The west dragon in storage at Hollywood Heritage on Friday, May 30, 2013. The MONA dragon will be completely restored to its original condition and placed on permanent display at the new MONA galleries in Glendale. A fundraising campaign to restore the east dragon was held by MONA on indiegogo, which attracted many donations, but the dragon is still awaiting restoration.. Transfer of the east dragon from the MONA storage facility to the restoration studio on Saturday, June 13, 2013. Photo by Kim Koga. Courtesy of MONA.